The shoulder holster 1911 provides gun owners with the ability to carry their semi-automatic pistols concealed. It can also be used by hunters, hikers and other outdoor enthusiasts wanting ready access to their pistols. With a shoulder holster 1911, you can easily access your gun whenever or wherever. Now, that we’ve established the importance of a shoulder holsters for a 1911, which one should you purchase? Comfort and efficiency are two key features any quality shoulder holster must have, and the three holsters in our review bring exactly that to the table. In 1970, the Famous Jackass Leather Company introduced the Jackass rig style of shoulder holster. Fast forward to the present day, the company is now known as Galco International and the Jackass style has been implemented in their wel known Galco Jackass Shoulder Holster. Unlike most shoulder holsters having a horizontal-only design, the Galco Jackass Shoulder Holster 1911’s horizontal position can be adjusted to a more vertical carry. Check the current price and more reviews here. The holster can be adjusted to both horizontal and vertical positions. It is designed for right-hand draw. However, a similar model exists for those who prefer to draw with their left hand. Its center-cut diagonal leather harness is made from quality premium steerhide. The four parts of the harness can be adjusted independently for greater comfort and increased concealment. A clover-shaped swivel back plate made from Galco’s patented Flexalon material connects the four parts of the harness together. The holster also features a magazine carrier and a set of system screws. The Galco Jackass Shoulder Holster 1911 is designed to be fully modular and can be easily customized to your own needs and requirements. The inside of the holster and leather straps are made from suede which prevent scratches on the gun. It comes with detailed instructions on how to properly break in the holster and ensure it is a comfortable fit for your gun. The holster is topped off with an Havana brown finish. Well-built with great stitching quality. Very effective for concealment purposes, as it rarely prints. The upward muzzle angle of the holster contributes to its ability to conceal guns with large frames. The holster is capable of comfortably accommodating a modified and fully-sized 1911 along with two spare magazines. 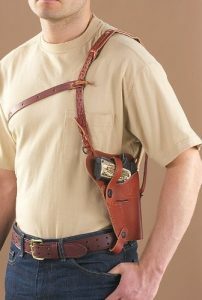 Most users claim that tie-downs are not really needed with this holster. Without the need for any modification, the attached leather straps ensure that the holster can safely carry a cocked and locked 1911. Due to its modular design, users can attach tie downs, flashlights and other accessories to their holsters if the need arises. 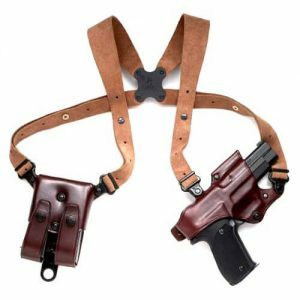 If you do feel the need for tie downs when using this holster, then you must purchase them separately as they are not included in the original purchase of the product. Quite costly when compared to the other holsters in this review. The muzzle up orientation of the holster makes it a bit harder to get a firm grip on the gun especially when compared to strictly horizontal holsters. The Galco Jackass Shoulder Holster 1911 is simply one of the best shoulder holsters out there. Requiring a maximum of one week to be fully broken in, the holster fits both your body and your gun quite comfortably. Before purchasing this holster however, it is highly recommended that you confirm from a reputable dealer if your semi-automatic pistol would be a proper fit for the Galco Jackass Shoulder Holster 1911. This is the heavy duty version of shoulder holsters. Tailored to fit the standard holster style of the US Military, this cannot be used as a concealed carry holster because of its front chest strap. It is however a great choice for hunters. The Military Style Shoulder Holster 1911 comes unassembled and as such, requires the user to first assemble it before use. The leather used in making this holster is very dry and must be thoroughly oiled and softened with a leather conditioner. The manufacturers of the Military Style Shoulder Holster 1911 are more interested in functionality than looks, and the result is a shoulder holster that is not very attractive but still extremely competent. The holster is completely made of cowhide leather. It features a front chest safety strap, an adjustable harness and a hold-down loop. It is designed for individuals with a small to average chest size. It comes in a light brown finish. Snaps and buckles are very secure and do not break easily. If well-conditioned, the holster fits your body and pistol quite comfortably. Repairs can easily be made to the holster with minimum cost and effort. Holster must be assembled before it can be used. Instruction guide provides very limited information on the assembly process. Leather is stiff and must be conditioned with large amounts of a good leather conditioner before it is usable. Harness is small, and as such, the holster cannot be used by big or heavyset individuals. The makers of this holster describe it as being ‘rugged, boot-camp tough and made to securely and comfortably carry your autoloader’. And that’s exactly what you get on purchasing the Military Style Shoulder Holster 1911. This is not a holster for a lazy person: it needs to be assembled and well-conditioned before it can be used. Lots of users make use of Lexol Leather Conditioner, Pecard Leather Dressing, Neatsfoot or Red Wing Boot oil in conditioning the holster’s leather. Whichever lubricant chosen, once the leather is sufficiently softened up, you would definitely enjoy using the Military Shoulder Holster 1911. This shoulder holster earns a place in our review due to its universality. 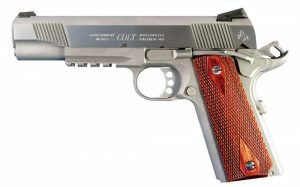 It is designed to fit almost all pistols ranging from medium to large-framed semiautomatics. The Tactical Shoulder Holster 1911 also grants its users the opportunity to adjust and reverse the holster’s position from a right hand draw to a left hand draw. The holster can also be adjusted to fit both small and large individuals. It is a universal holster capable of accommodating most pistols. It includes a large double ammo carrier located on the opposite side of the holster pouch. It is designed to be reversible for either right or left hand draws. 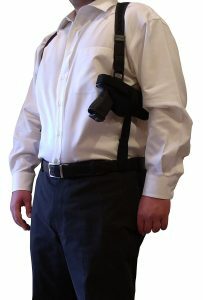 The Tactical Shoulder Holster 1911 can be adjusted to fit the body size of its owner. It can be reversed for either left or right hand draws. It can be used for most semiautomatic pistols. This is the cheapest of the three holsters being reviewed. It can be easily adjusted for small or large body frames. This holster comes in handy for quick draws as it is very easy to release. Secure retention straps ensure your gun does not slip out of the holster. Even with its size-adjustable feature, it barely manages to accommodate large-chested individuals. When the holster is reversed for the left hand draw, the ammo pouch becomes wrongly positioned, making the left hand draw position of the holster not so effective and comfortable. It leaves a noticeable imprint when worn, making it quite ineffective for concealed carry. At such a low price, the Tactical Shoulder Holster 1911 gives great quality. Its universality and reversible draw are its much loved features, making it stand out from several other shoulder holster 1911 brands in the market. For some customers, these beneficial features can be viewed as disadvantages, especially for those wanting a pistol-specific holster for their guns or users who are much more comfortable drawing with their left hands. Despite these downsides, the Tactical Shoulder Holster 1911 offers great value and gives you your money’s worth. The three shoulder holsters reviewed are certainly geared to meet the needs of virtually all gun owners, but the Galco Jackass Shoulder Holster 1911 is in an impressive class of its own. Made from top-notch leather, suede and Galco’s very own patented Flexalon material, this holster doesn’t feature any metal bit, and thus, eliminates the possibility of corrosion due to sweat or unforgivable weather elements. It can be comfortably used for concealed carry and adjusted for either vertical or horizontal use. If you are not interested in concealing the weapon, then the Galco Jackass Shoulder Holster 1911 is equally up to the task, having a refined and elegant look some customers have referred to as ‘dressy’. You can also attach flashlights or other accessories to the holster for hiking and hunting trips. This holster is definitely not cheap, but it is worth every dollar. like thіs. Thanks for sharing.